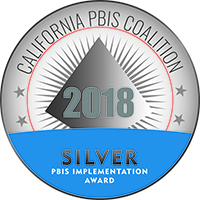 The California PBIS Coalition has recognized BCOE schools with the 2018 Silver Implementation Award. BCOE schools recognized were: Hearthstone School, Table Mountain School, BCCS - LEAD and BCCS- Step Up. PBIS stands for Positive Behavioral Interventions and Supports. "Schools that are effective in their implementation have (a) more than 80% of their students and staff who can indicate the desired positive behavioral expectations for a given school setting, (b) high rates of positive acknowledgements for contributing to a positive and safe school climate, (c) have more than 70-80% of their students who have not experienced an office discipline referral for a disciplinary rule infraction, (d) a good idea about which students require more intensive behavior supports, and (e) systems for regular review of their school-wide behavior data to guide their PBIS action planning and implementation decision making." "In addition, since the 1980s, a number of experimental studies have documented the effectiveness of the PBIS framework at the school-wide level. This body of research supports improvements in problem disciplinary behavior, school climate, organizational health, student bullying behavior and peer victimization, and academic achievement."